Ted "Theodore" Logan is one of the founders of the WYLD STALLYNS band! 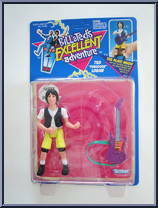 He and his buddy Bill travel through time in their phone booth for one crazy adventure after another! Squeeze Ted's legs together to activate his outrageous guitar-playing action! His head must be manually returned to the front. Contribute pictures, update details or suggest corrections for Ted "Theodore" Logan. Write a review about Ted "Theodore" Logan.